päivämäärä Toukokuu 3, 2016, 1:42 p.m.
Every referendum and election is unique. Each contains its own issues and is driven by different personalities and arguments. However, they are not so different that we cannot learn lessons from previous elections and referendums that help us find our bearings in other campaigns. On the face of it, the Scottish referendum campaign has some strong similarities to the current one over the UK’s EU membership. Both are referendums about independence, and both centre on a battle over questions of sovereignty and the economy. Of course, there are many differences too, but not so many that the Scottish referendum can’t teach us some valuable lessons about EU referendum polling. In both the Scottish and Alternative Vote campaigns early polls were really not a very good guide to how people ended up voting. Four or five months ahead of the Scottish referendum, polls we were consistently showing a twenty point lead for NO – and in the AV referendum we had YES ahead until public opinion switched over in the weeks leading up to the vote. In neither case were early polls a good guide to how people ended up doing at the ballot box. For this reason, it is sensible not to read too much into EU referendum polling up to this point. Between March 2013, when the date for the referendum was announced and August 2014, as the campaign entered its final stages, the story of the Scottish campaign was one of stasis. 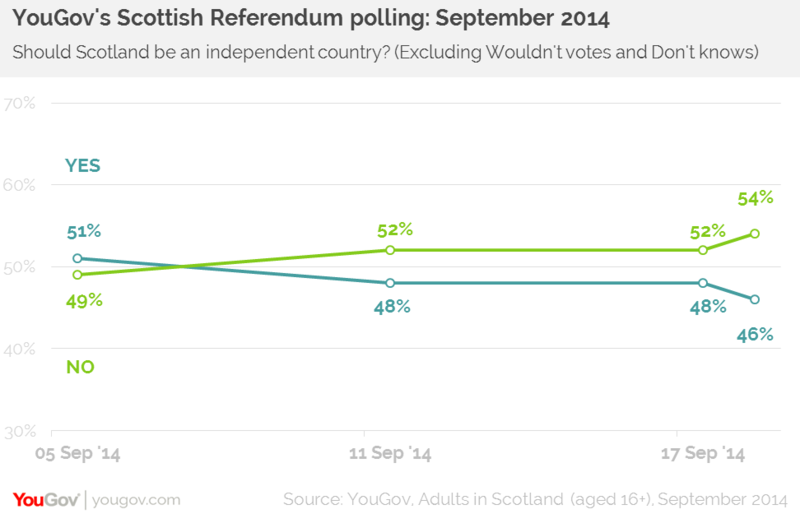 The gap between YES and NO was consistently around twenty points and very little appeared to change this. Even major developments (such as George Osborne saying he would block an independent Scotland from using the pound) didn’t seem to shift the polls. However, this finally changed when we reached the last six weeks of the campaign, as voters started paying attention. When public opinion shifted, it shifted fast. We have seen a similar story to date in the EU referendum campaign. While there were some sharp short term movements in public opinion around the time of David Cameron’s renegotiation, our EU polling so far has been very steady. Don’t assume that this means the public have made their minds up, though; it may well be that they haven’t properly paid attention yet. 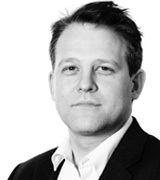 Traditionally public opinion in referendum campaigns moves towards the status quo as polling day approaches because voters that are initially attracted by the idea of a change are increasingly put off by the possible risks. 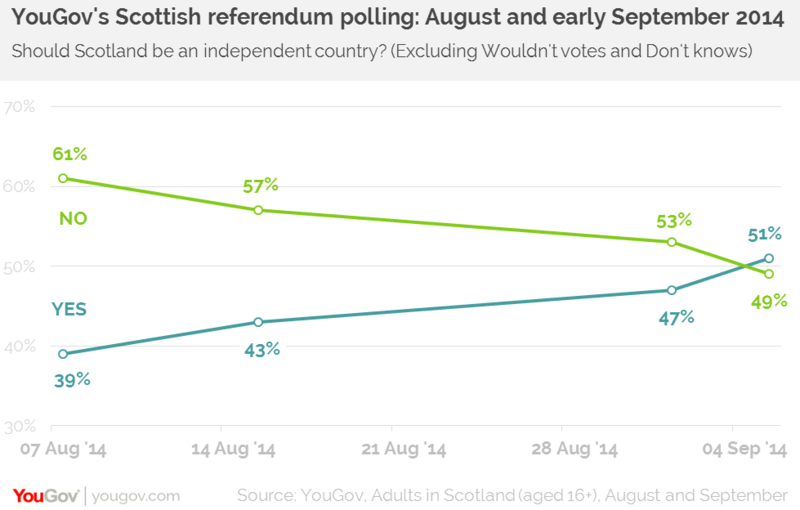 However, the movement during August 2014 in Scotland went in the opposite direction. At the start of August our polling showed a twenty-two point lead for NO, but then three successive polls charted a steady shift in public mood towards YES. This was not random noise. It was consistent across both our own polling and those by TNS and ICM, which also showed the race becoming neck-and-neck. As we use an online panel for our research, we could check this movement at an individual level and we found that it held up: people who in June 2014 said they would vote NO told us in August 2014 that they had changed their minds and planned to vote YES. A possible explanation for this shift was that the YES campaign managed to turn the burden of risk around. The movement we saw coincided with YES claiming that the Scottish NHS would be at risk if the country remained part of the United Kingdom. Our polling found that the claims about the health service chimed with the Scottish electorate – by 42% to 9% people thought that the NHS would get worse if Scotland voted NO. The Leave campaign will have learnt these lessons and are applying them to the EU referendum campaign. They seek to talk about the risks of staying in the EU to try and make sure it doesn’t just become a contest between the “safety” of the status quo and the “risk” of exit. We’ve already seen the Leave campaign talk about risks to the NHS from remaining in the EU, but to date our polling shows the public still see Remain as the safer choice. Ultimately risk aversion won out in Scotland. While a range of polls at the start of September showed YES and NO neck-and-neck, over the final fortnight of the campaign there was a sharp movement back towards NO. By the 11th September – a week before the vote – our polls again showed NO in the lead, albeit by a small margin. Part of this shift was ascribed to “The Vow” – the promise the UK party leaders made to give extra devolved powers to Scotland. However, we believe a lot was also down to risk aversion. Although people thought the YES campaign was more honest and more positive ultimately they still thought they would be worse off in an Independent Scotland and so ended up voting NO. A similar thing may happen in the EU referendum. The British population is generally Eurosceptic and most would prefer to cede fewer powers to Brussels and have greater control over immigration. However, they also consistently think that Britain leaving the EU would be bad for the economy, bad for jobs, and bad for their own finances. If the Leave campaign cannot turn these views around then it is likely that these issues will play heavily on voters’ minds as polling day approaches. Our final Scottish survey ahead of polling day was conducted between the Monday and Wednesday before the vote and showed the NO campaign leading by four points. However, this was not the end of the story. On the day of the referendum we re-contacted the same people who had taken part in the poll earlier in the week and asked them which way they had actually voted. The results showed that there was a genuine late swing. Some people who said at the start of the week that they planned to vote YES changed their minds in the final hours and told us that ended up voting NO when we re-contacted them again on the Thursday. This late movement amounted to a swing of two percent from our final pre-election poll and gave us the confidence to call the referendum for NO as soon as the pols had closed. When all the returns were in, our on-the-day poll was within one percent of the final result. Naturally, there are marked differences between the EU referendum and the vote in Scotland. As yet we do not know how crucial factors – such as turnout – will pan out, or if there will be any unexpected events that could influence voters. However, our research over the course of the Scottish referendum gives us a clear guide to how voters feel and the forces that drive them to change their minds during the course of such a campaign. It also helps to provide some context to current polling. As the final weeks of the EU debate unfold, keep an eye out to see how many of the factors outlined above come into play in the lead up to June 23rd.